Alton Brown says I should bake my eggs instead of boiling. Sure, why not. I had three eggs in the fridge I wanted to use before my next trip to the store so I threw them in the oven for a test drive. – No dirty pot. I put a strip of aluminum foil under the eggs in case one broke. One did break, but nothing oozed out so absolutely no mess. 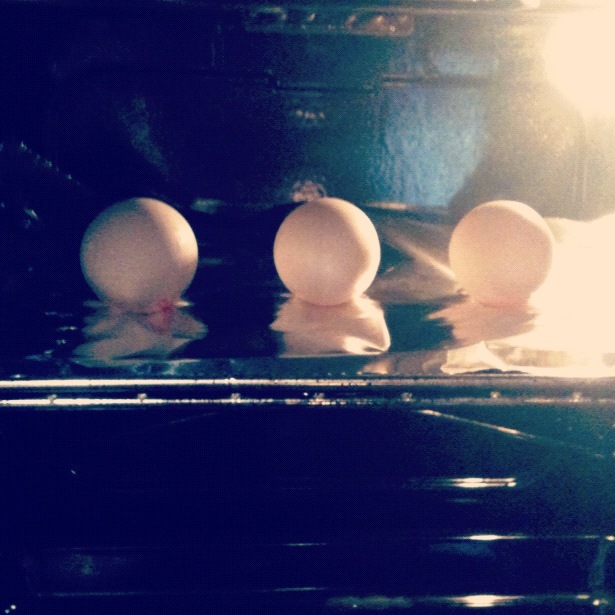 – I am pretty sure if I accidentally over cook the baked eggs they will explode in the oven, and then things will get really ugly. I don’t know if I am sold on this whole baked egg thing, but I think it deserves a few more tries before I write it off. Has anyone else tried baked eggs? I would probably cover them JUST IN CASE!!! Wrap them in the foil.